In a rare video call to the International Space Station on Tuesday, RT asked Roscosmos cosmonaut Mikhail Korniyenko and NASA astronaut Scott Kelly questions from the channel's viewers. 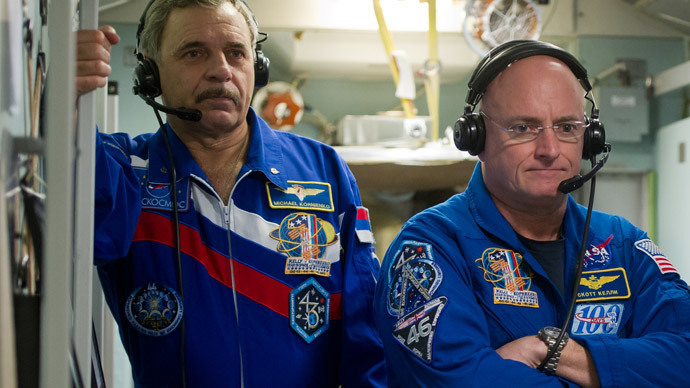 The crew opened up about the pros and cons of space life. RT viewers grounded on Earth were understandably curious about life on the International Space Station (ISS), asking questions ranging from the coffee situation, to whether relations between the US and Russia affect the astronauts' relationship with one another. Perhaps the most obvious hardship faced by the ISS residents is the fact that everyday earthly luxuries – such as hot showers and the ability to breathe fresh air – simply don't exist in space. He added that there is simply no escaping work – because he can't go home at the end of the day. But there is at least one luxury that will soon be enjoyed by Kelly and Korniyenko – coffee. Referring to the espresso machine that was just delivered to the ISS, one RT viewer was curious if the astronauts had already brewed themselves a cup or two. While Kelly said that he and Korniyenko“definitely look forward to the espresso machine,”he said they have not yet had a chance to enjoy it. But even once the machine is christened, the astronauts understand the need to use it sparingly – because they only have 15 servings. “Unfortunately they use the single serving cartridges...I think we only have 15 of them now so we're not in any kind of rush to get through them and use them all up,”Kelly said. And when the coffee runs out, the astronauts also won't be able to pop open a can of beer. “It would be nice [if we had beer, but we don't]. One problem if any kind of carbonated beverage...when you open a beer or soda on Earth the carbonation will come to the top and out of the bottle...when we do that in space it would just stay in the liquid itself; it wouldn't rise to the top. So you'd be drinking a beverage that would have a lot of gas in it, so that's not ideal,” Kelly said. Beer- and coffee-drinking aside, some of the questions posed by RT viewers were a bit more serious. Speaking of jobs, the two high-fliers have one that is envied by space enthusiasts and adrenaline junkies around the world...but one viewer was curious how Korniyenko came to enter this line of work. But that doesn't mean the two men don't dream of life back on Earth from time to time.